How has representation of a certain group improved in TV and film? What can be done better? Emerson College administrators seem to think that what I went through was not painful enough. Maybe if he left marks around my neck when he had me in a headlock, or maybe if someone saw it happen, they would have acted differently. Overall queer representation in television is improving, but there is still a long way to go when many queer people still can’t see themselves on screen. It is not the duty of students to carry the weight of reformed social inequality in the classroom, nor should it be—we should be able to rely on our educators to do their research. Referring to a transgender individual by their birth name, or “dead name,” can be upsetting and disturbing. It is also a problem that was never supposed to happen in the first place. When incoming students are instructed to drop thousands on a computer with little prior warning, it becomes an issue of classism. Although I’ve been an Emerson student for a year, the achievements of student-led endeavours continue to astound me. For a school so concerned with the overcommitment of its students, the assumption that they would have time for four hours of meetings on weekdays seems counterintuitive. Activism for applause or for a cause? If our current president is any indication, the line separating entertainment and politics grows blurrier every day, and it’s difficult not to notice the surge in socially-conscious celebrities. When we left school at the end of the spring semester, it was the last time we would see the campus to which we had grown accustomed. Students pen their expectations for Emerson in the new school year. At all colleges and institutions, the freshman experience is subjective—what may work for one student may not work for another. Our administration should reflect the complexity of the individuals attending our college with an impartial approach to clubs and organizations. Youth is about self-discovery. It’s OK to try new things, fail, and try again—only then can students find a true passion to follow. This summer, I found myself in Paris staying with a friend of a friend, a person I had never met. 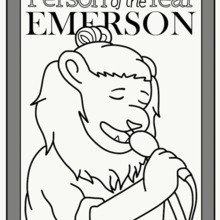 The announcement of Griff, the anthropomorphized hipster lion, as Emerson's person of the year threw everyone for a loop.